These are lyrics by Toni Basil that we think are kind of repetitive. This whole song is the same lyrics over and over again. 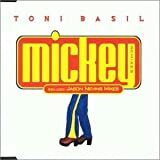 I don't think Mickey thinks you're so fine, Toni -- he's probably sick of you singing his name over and over again!